Aluminum doors are a top choice for many people because they are both affordable and durable. It is a difficult task to break through an aluminum door, so they could be considered security doors. They have the advantage of being lightweight and come in all sorts of unique finishes. Aluminum doors are often used on buildings and homes because of the reliability and cost. It is difficult to install a full security system with just a few doors of secure build, so when many doors are needed, aluminum becomes one of the top options to consider. Security services in New York often recommend aluminum doors with strong locks for external security to a home or business building. 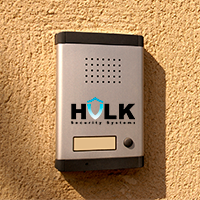 Hulk Security Systems has master locksmiths on board to help provide the best installation of doors and locks both inside a building or home or externally. We have several different locks to choose from for a high level of security to include with aluminum security doors. When you are making your home more secure, we can help you stick to your budget and have a superior security system. Your external doors can be strong, lasting security if they are made of aluminum and you will save money compared to solid wood doors. Security services in New York are abundant, but none of them match up to the standards of Hulk Security Systems.